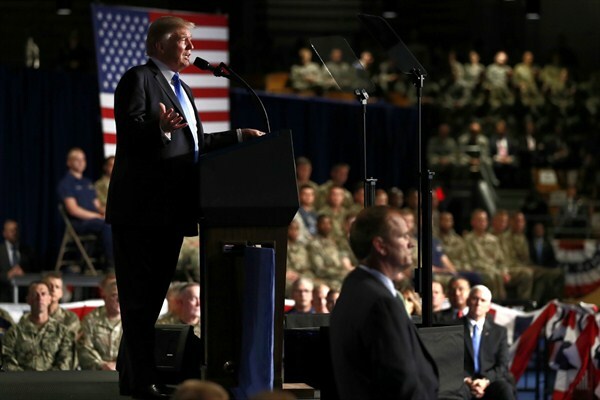 U.S. President Donald Trump addresses an audience of soldiers about his new Afghanistan policy, Fort Meyers, Virginia, Aug. 21, 2017 (AP photo by Carolyn Kaster). In this week’s Trend Lines podcast, WPR’s senior editor, Frederick Deknatel, and associate editors, Robbie Corey-Boulet and Omar Rahman, discuss the new U.S. strategy for the war in Afghanistan announced by President Donald Trump and what it reveals about Trump’s foreign policy agenda so far. Are the U.S. and Its Allies on the Same Page on North Korea, Russia and Iran?